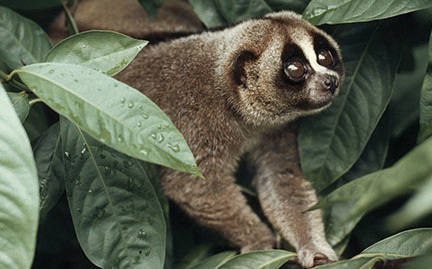 Slow lorises are nocturnal and arboreal, or tree-dwelling, primates. They move with slow, deliberate hand-over-hand movements through the trees but can move quickly if necessary. A keen sense of smell helps them locate prey in the dark, and their strong grasp allows them to stay in one position for hours.